Seven years is a long time between albums. Then, Lord of Mushrooms' third album only began take shape in 2008, with recording following a year later. But finally it's here, with new lead singer Gus Monsanto (Adagio) on board. Above, Lord of Mushrooms: what's up there, fellas? You don't need to be on mushrooms or some other hallucinogen to enjoy Perspectives. But headphones might help. While not necessarily overly technical and complex, this whole album has an ethereal, sometimes heavy, often sharply bright and, here and there, a brooding ambience to it. That descriptions barely scratches the surface of what's within Perspectives. Maybe it's the piano parts that first get your attention as they often lead some arrangements like Imago or The Missing Link. Other keyboard/synthesizer parts tumble between conventional to quirky to surreal. There's also a large amount of care given to the vocal arrangements. On a song like Warmth in the Wilderness or The Missing Link, the compositions seemed designed to allow Monsanto simply to glide upon the music. He sounds amazingly comfortable throughout. Generally, the music has an incredible ebullience to it, while traversing moods. The short Red Queen's Race is loose and accessible, lively like melodic rock. Nyx's Robe echoes those earlier words of heaviness and brooding, but bristles and sways with a nearly jazz/rock fusion quality. Lord of Mushrooms' Perspectives is a profound example of why we like progressive music: there's creativity, intrigue, and strong musicianship throughout, enough to keep you guessing and entertained. Recommended. 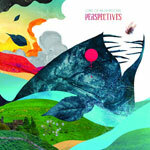 Lord of Mushrooms' Perspectives is a profound example of why we like progressive music: there's creativity, intrigue, and strong musicianship throughout, enough to keep you guessing and entertained.